This plan has been discontinued as of Nov 21, 2018. There are alternative plans available on Green Card Insurance Plans page. Green Cover insurance provides comprehensive travel medical coverage for green card holders between the ages of 60 and 95 years old who are not currently elligable for Medicare. 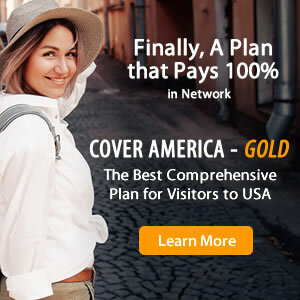 This temporary travel medical insurance plan pays 80% of the first $10,000 then 100% up to the policy maximum. Travel medical protection offered by Green Cover includes outpatient treatment, emergency services, emergency medical evacuation, and more. Green Covers policy term is up to 364 days. Green Cover insurance is best suitable for non green card holders awaiting Medicare eligibility (Part A or Part B). US green cardholders between the ages of 60 and 95 awaiting eligibility for Medicare.